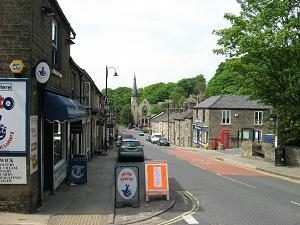 One of the most important streets through Bollington now. But on the 1841 census it was called Gt High Street and included about 70 houses, one being Bank House. Palmerston Street begins at the junction with Hamson Drive, Shrigley Road, Ingersley Road and Church Street – marked today by a mini-roundabout. 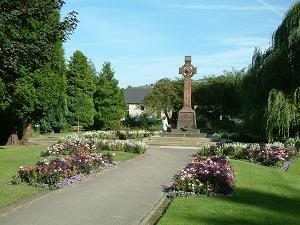 It continues through the shopping area, past Bridgend, the Memorial Garden and Coronation Garden playground. It then goes under the Macclesfield Canal aqueduct to its end outside the Dog & Partridge inn at the junction with Wellington Road, Adlington Road and Round Gardens. Approach off Wellington Road, Shrigley Road, Ingersley Road or Church Street. Leads to Queen Street (both ends), High Street, Pool Bank car park, Beeston Brow, Church Mews, Water Street, Clarence Road, Hurst Lane, Coronation Buildings, Round Gardens (both ends). Nearest shops – in the street and in High Street. Nearest pubs – Spinner’s Arms, Holly Bush, Dog & Partridge all in the street, The Turners, Cotton Tree and Church House nearby. Restaurants in the street and in High Street. Post Office, but no longer here! There used to be a post office in Palmerston Street, in two different locations, almost opposite each other (not at the same time!). Palmerston Street, named after Lord Palmerston who was a minister of the Crown for 45 years before becoming Prime Minister in 1855, had been heavily developed in the early 19thC. 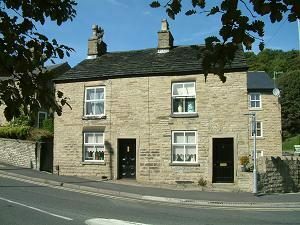 The stimulant was, no doubt, the building of the Macclesfield Canal in the late 1820s which involved much change to the river Dean valley around the point where the street passes under the canal. 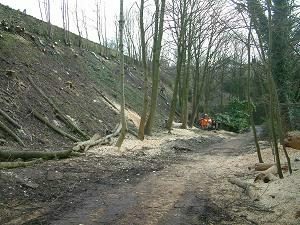 It is probable that the original road connecting West Bollington with ‘old’ Bollington went through what we today call Round Gardens – they cut off that loop with a straightened road that went all alongside what is now the Recreation Ground, then under the aqueduct and across some marshy ground, where the river had run before it was routed to Water Street and the tunnel, to the foot of Beeston Brow and into Queen Street. The original through road continued along what is today the lower part of Queen Street (see Queen Street and the Old Route). So the section of Palmerston Street from Beeston Brow to, say, High Street was built from about 1830 on. It is possible that there was a street along some of this prior to that date. For instance, I suspect that the section from the junction with Church Street to Queen Street is a very old road; it may even have gone as far as High Street. 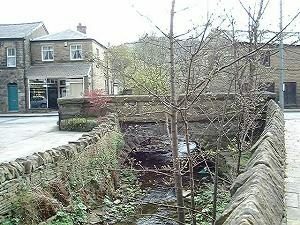 The bridge over the Harrop Brook at Bridgend is relatively recent, there being report of a ford here in the mid to late 19thC. Before this time the street was named Great High Street. In 1920, after WWI, a Memorial Garden was built between Palmerston Street and Water Street. As elsewhere, a Service of Remembrance is held here each year in November. On the opposite side of Palmerston Street is Coronation Gardens, established in 1953 to mark Queen Elizabeth II’s coronation and fully re-furbished in 2013, Golden Jubilee year, which is devoted to a young children’s play area with all kinds of fun equipment to keep them happy for hours! Older children will find their play area in Adlington Road, complete with a skate park. The variety of house types, structures and materials suggests that they were built over a period of time by many different builders. 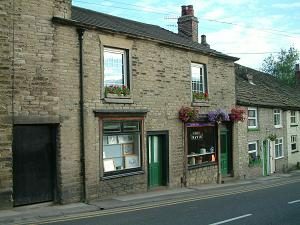 This pair (left) of two up two down cottages were refurbished around 2000. One was used for many years by the Kirk family as their coal order office. 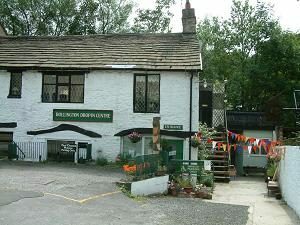 The Bridgend Centre is located in a very old farm house at Bridgend. Notice that the floor level is substantially lower than the ground and road in front of it – this is because the building pre-dates the canal, the time when the ground between the canal and Bridgend was significantly raised by the addition of earth from the first, failed, attempt at building the embankment. Notice, too, Throstles Nest cottage opposite the Bridgend Centre is similarly set down in the ground. The building to the right of the Bridgend Centre (not pictured) stands on the site of Bollington’s Empire Cinema. The building was later used by motorcycle mechanics responsible for world champion Mike Hawthorn’s racing bikes, and so the modern building is named Hawthorn House. These names refer to the track beside the Macclesfield Canal by the aqueduct, between the canal embankment and the Recreation Ground. This is said to be where the young men of the town took their young ladies to make their pledge and take their pleasure! From the roundabout to the aqueduct this street is in the Bollington Conservation Area. Numbers 3, 5-13, 15A, 19-27, 29A, 29B and 29C, 31-37, 32-36, 44 and 46, 53 and 53A, 55-79, 56-60, 64 and 66, 72, 98 and 100 are subject to Article 4 Direction. The canal aqueduct and adjacent land is in the Macclesfield Canal Conservation Area.